The OCT-HS100’s extensive automatic functions simplify and optimize examinations. A single mouse click correctly aligns and focuses on the retina to maximize scan quality. The operator then decides with a second click when the scan itself will be initiated, allowing full control over the instrument. The high scan speed of 70,000 A-scans/sec results in very short examination times, typically under two seconds – improving efficiency and resulting in a very patient-friendly experience. The OCT-HS100’s Full Auto feature significantly simplifies operation; standard procedures can easily be delegated and results are operator independent. 70,000 A-scans per second allow two-second examinations for reduced risk of motion artefacts and increased patient comfort. 3μm axial optical resolution for unsurpassed image quality. The OCT-HS100 will automatically maintain the exact alignment on the center of the eye. This real-time tracking will provide better images quality with reduced motion artifacts. Scan depth is automatically adjusted. Automatic compensation of patient refraction. The OCT-HS100 can recognize ten boundaries of the retina; detection of Bruch’s membrane (BM) is now possible. For high quality retinal observation and precise follow up examinations. Increased effectiveness of examinations by capturing large areas with just one scan. SLO tracking allows accurate follow up examinations using the same scan position and identical scan parameters: Scan mode, position and size, fixation target position and size. With the optional OCTA-2 software module, up to 200 scans can be combined for superior image quality. Five stored examination sets: Macula Disease, Glaucoma, Choroid, Anterior and General. Examinations for other retinal diseases can be easily created. Using Enhanced Depth Imaging, two modes can be selected based on the pathology: Choroid Mode for detection of choroidal neovascularization. Vitreous Mode for the detection of epiretinal membranes or vitreo macular traction. Imported retinal camera images are automatically aligned and overlaid on to the SLO image with precise position matching. The OCT-HS100 takes up very little floor space and is flexible for use in most situations — even against a wall or in a corner. 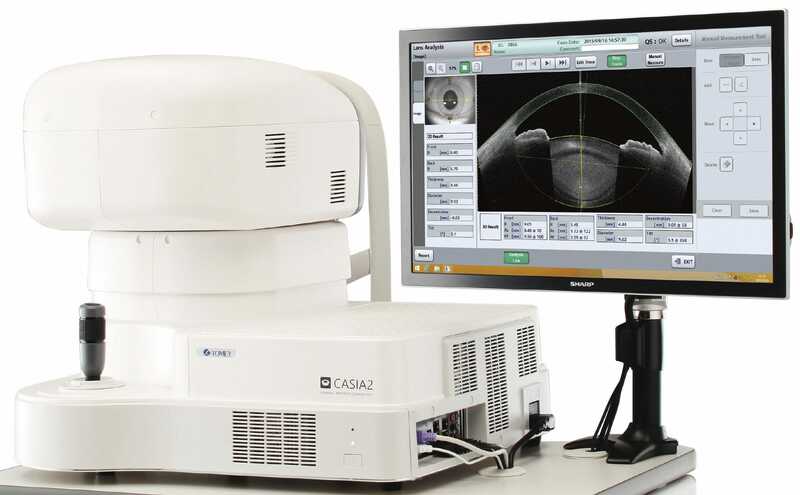 The OCT-HS100 software is part of the Canon Ophthalmic Software platform RX. This means that the OCT-HS100 can be used stand-alone but it can be installed in even the most complex IT environment , including DICOM. With the optional Anterior Segment Adapter , images of the anterior segment, including the cornea and chamber angle, can be captured. Using command line interface and launcher functions a very efficient workflow can be realized . From the EMR the OCT software will open on the selected patient and vice versa. Patient data can of course be input manually but also by the very efficient and timesaving way of importing lists from your practice Management systems or a modality worklist in a DICOM environment. Canon’s expertise in optics and innovative technology has resulted in a fantastic 3 micron optical axial resolution for amazing scan quality. The built in Scanning Laser Ophthalmoscope (SLO) allows for high quality retinal observations and precise follow up examinations. 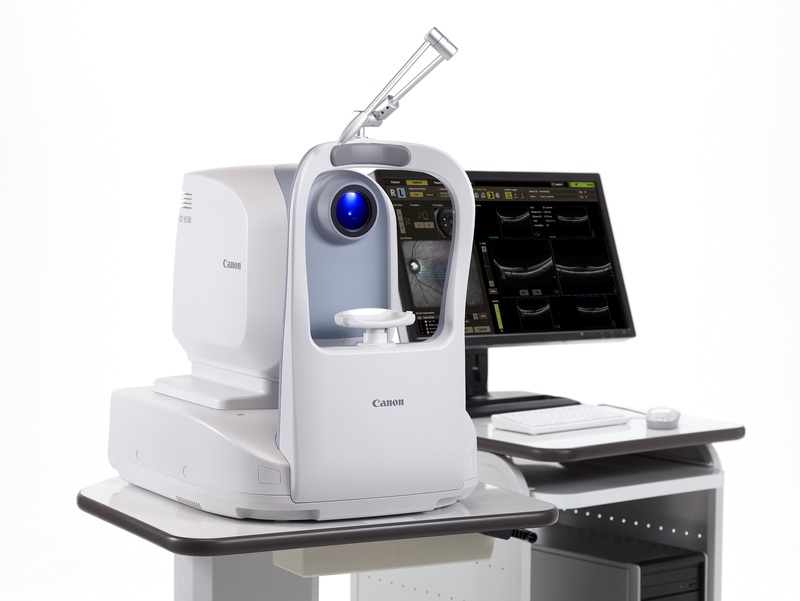 The OCT-HS100 software is part of the Canon Ophthalmic Software platform RX. This means that the OCT-HS100 can be used stand-alone but it can be installed in even the most complex IT environment . OCT- Angiography is also possible with the OCT-HS100 with the optional Angio Expert (AX) software. Also current OCT-HS100 users can upgraded to OCT-Angiography, since it involves only a software upgrade. This is a new optional software module that will provide demanding users with the highest possible image quality.